Every Best of Joey Diaz video! Over the last couple of years, the Joe Rogan Experience’s YouTube channel, PowerfulJRE (LINK!) has released the occasional ‘best of’ video compilation, of funny moments from some of the regular guests on the podcast. Before Joe’s staff started producing these videos, fans of the podcast were making their own. Some of the most famous of these were uploaded by THIS YouTube account, Brandon Farley, formerly known as MischiefMaker37. He made and uploaded 3 hilarious highlight videos of Joey Diaz JRE moments between 2011 and 2013, that Joe Rogan has mentioned his admiration for, on a number of occasions. A fourth ‘Best of Joey Diaz’ video was then uploaded by Joe’s Youtube account in 2015. Here are all 4 parts of the Best of Joey Diaz series, released so far! 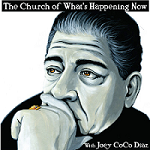 3 of the Best Joey Diaz Podcast Appearances!